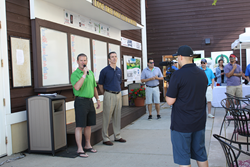 On June 1st, All Copy Products hosted their fifth annual charity golf tournament benefiting Warren Village at Lone Tree Golf Club with their title sponsor for the fifth year, Konica Minolta. Giving back to our local communities is at the heart of what All Copy stands for, and we are excited for the opportunity to work with Warren Village for many years to come.” stated Brad Knepper, CEO of All Copy Products. This year we had 128 players tee off to support a great cause. With the generous support of all the sponsors and participants, our 2018 charity golf tournament was the most successful to date raising a total of $26,266.44. All proceeds are going to support Warren Village, a Denver based charity that helps low income, and single-parent families achieve sustainable, personal, and economic self-sufficiency. “All Copy Products, Verticomm and all of the tournament’s sponsors and participants are honored to support great local charity." Warren Village provides a one-of-a-kind environment to help single-parent families succeed with family services including early learning and education programs for children. "Giving back to our local communities is at the heart of what All Copy stands for, and we are excited for the opportunity to work with Warren Village for many years to come.” stated Brad Knepper, CEO of All Copy Products. “The Warren Village residents, staff, and board are so thankful to All Copy Products for their continued support of our mission and their leadership in the area of corporate social responsibility. The funds raised through this year’s event will have a huge impact on the lives of the parents and kids at Warren Village—representing an investment in our community and beyond. We are so proud to be a partner with All Copy Products as we work to improve the lives and futures of families leaving poverty!” stated Ethan Hemming, President, and CEO of Warren Village. We wish to thank all of the sponsors that made meaningful contributions: Konica Minolta, Restaurant Solutions Inc., Square 9, Canon, Richie May, Printer Logic, DLL, WPromote, Everyone Print, Professional Bull Riders, Enterprise, Muratec, Alavorado Holdings, Cushman Wakefield, SDR Ventures, NEC, Denver Broncos, Great America, Colorado Rockies, Bryan Construction, Lockton, Palo Alto, The Tavern, and Mike Ward Infiniti.